Over the course of the year she holds group discussions to determine what kind of play creates or calms turmoil; she illustrates (or rather the children illustrate) the phenomenon of very young children needing to make sense of exceptionally violent imagery; and she consults with older grade-school boys who remember what it was like to be obsessed by violence and tell Katch what she can do to help. Katch's classroom journey-one that leads her to rules and limits that keep children secure-is an enabling blueprint for any teacher or parent disturbed by violent children's play. "Jane Katch is a gutsy teacher and she has written a fascinating book about the obsessions and fears of boys in elementary school. Under Deadman's Skin makes it clear why school boards and politicians cannot legislate boy violence away. We all need to understand boys the way Jane Katch does." "Like Vivian Paley before her, Jane Katch takes us inside the minds and hearts of young children. She suspends judgement and her own fears to walk alongside her young students." 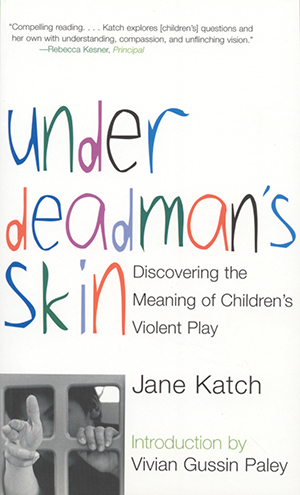 "[Katch] tackles many of the most perplexing questions about classroom violence: Do violent movies make violent kids? Are boys more violent than girls? And how does the act of exclusion lead to a cycle of violence?"